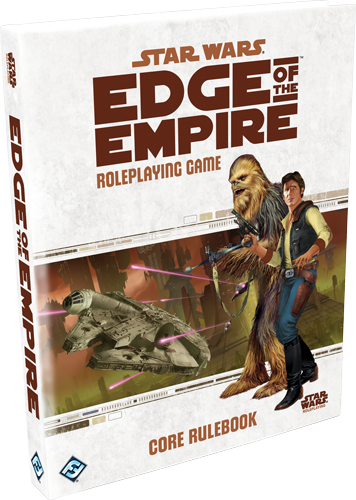 If you listened to Episode 110 of the Podcast, you will know that Rich Jones was very enthusiastic about Star Wars: Edge of the Empire, the new roleplaying game published by Fantasy Flight Games. This was announced at GenCon 2012 and the core rulebook has just been published. Following Episode 110, Rich suggested that it might be an interesting idea to try playing EotE via Skype – there was no way that we could get together to play face-to-face in the short term – and so he gathered a group of friends together to play an adventure. We’ve now played 2 acts of a 3 act adventure, and I’ve recorded both sessions. I present them here for your listening ‘pleasure’. You may want to also look at the accompanying blog, which gives some more character detail, and also has the maps for the first game. I know this might not be to everyone’s liking, but I thought that it was something different, and I think that there is enough in the sessions for them to be both entertaining, and for you also to get a grasp of how the FFG dice system works in practice. I enjoyed reading the Act overviews/summaries. I really enjoyed the first act, looking forward to listening to the 2nd one. I enjoyed the live recordings of the RPG sessions. It’s given me a good overview of the rules and dice mechanics, which sound original and innovative. I got caught up with the drama of Hobbsie and the shooting contest, in episode II. You’ve persuaded me to buy the beginner’s box of the game. If I could make one comment, the background music in episode II, made it difficult to hear some of the players. It might work better if music is edited on after the recording, rather than played over Skype. I’d love to hear game recordings for some of the hybrid RPG – Wargames, such as TOUR OF DARKNESS (Vietnam), WEIRD WAR TWO (WWII), or NECROPOLIS 2350 (sci-fi). I’d forgotten about the music, I agree with Andrew, it did make it difficult to hear sometimes. I’m enjoying the first episode, looking forward to the next. Will someone please move the budgie? Really enjoyed listening to Act 1. So much so it’s convinced me to buy the core Rulebook! I’m particularly looking forward to incorporating the odd X-wing skirmish game into the scenarios, seems like a perfect way to keep things fresh mid-session. really enjoyed the first two Acts, when’s the next one due ? Loving this! Listening to ep 1 now. Again, loving it! Making me want to play as well!